Do You Dare Join Secret Wars Too? 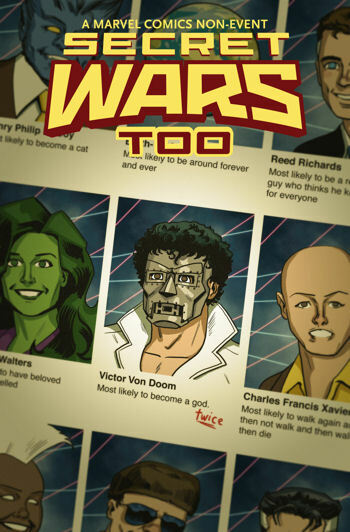 It's bad enough I'm caught up in Secret Wars; now Marvel has to hit one of my weak spots with their own parody book? At least it's good to know Jonathan Hickman has a sense of humor about himself, and that alone would have me interested. But that cover... yes, I think there were a couple of kids in high school that thought that. Give Secret Wars a grand sendoff as some of the hottest names in the comics industry bid adieu to Battleworld later this year! Today, Marvel is pleased to present SECRET WARS TOO #1, an oversized one-shot of epic proportions coming to comic shops and digital devices in November! Secret Wars scribe Jonathan Hickman himself unites with the likes of Sergio Aragones, Ryan Browne, Al Ewing, Rob Guillory, Kate Leth, Eric Powell, Declan Shalvey, Kyle Starks, Ramon Villalobos and Brittney Williams to bring you a 40 page epilogue to the biggest comic event of the year. Prepare for a side of Secret Wars you’ve never seen before when SECRET WARS TOO #1 hits stores this November!